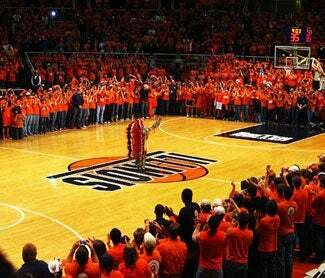 Last night, as tons of teary-eyed Central Illinoisians will tell you this morning, was the final dance of Chief Illiniwek, the skipping, painted white-guy-dressed-up-as-Injun who has "performed" at halftime of our alma mater's sporting events for the last 80 years or so. Like most alums — or at least the ones who have a hard time emotionally identifying ourselves with a college kid in war paint, or any mascot, really — we're both kind of sad that a symbol of our youth won't be around anymore and pleased that the whole "debate" will finally end and we can get on with our lives. Can't we just be the Wildcats like any other university? It would be nice to have a dumb, innocuous mascot that nobody thinks or cares about. Anyway, if you're one of those people who likes to relive final evenings over and over again, here's a photo gallery of the Chief's last hooting and/or hollering. And don't worry about the Chief; after his last dance, he was driven home by Jamar Smith, so he'll be just fine.